RockChickenz: Former Mushroomhead Vocalist Waylon Reavis Featured on New AMERAKIN OVERDOSE Track "Letting Go"
Former Mushroomhead Vocalist Waylon Reavis Featured on New AMERAKIN OVERDOSE Track "Letting Go"
Fast-rising five-piece AMERAKIN OVERDOSE are paving their way towards being the next big thing in shock rock with their upcoming full-length album, The Great Amerakin Dream, out September 30, 2016. The melodic hard rock record, which also blends groove and synth/industrial metal influences, will hit digital retailers such as iTunes and CD Baby soon, with pre-orders now available via Bandcamp. AMERAKIN OVERDOSE recently created a controversial buzz with their new track "I, Alone"
The band's quickly-growing fanbase, social following and rapid organic attention helped push the video to over 30,000 views in just under two weeks - a rare feat for an independent hard rock artist. Today, AMERAKIN OVERDOSE are following up with their brand new track "Letting Go" - a more impassioned take on the band's heavy-hitting sound - featuring guest vocalist Waylon Reavis, formerly of Mushroomhead. Reavis lends his ominous clean vocals to the track's chorus. Take a listen here, exclusively via idobi Radio. A music video for the track is scheduled to be released this fall. AMERAKIN OVERDOSE multi-instrumentalist and The Great Amerakin Overdose producer The Human states, "'Letting Go' is a track about conflict, and how we as people almost seem to seek out that conflict instead of growing above and beyond it. There is a back and forth at work in the track both lyrically and musically that represents the struggle to let go of the anger we have and move forward." 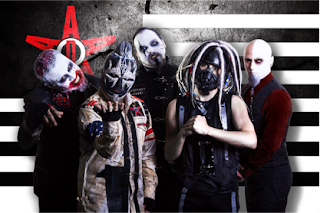 AMERAKIN OVERDOSE caught Waylon Reavis' eyes and ears when they shared the stage with Mushroomhead on tour in 2015. He was impressed by AMERAKIN OVERDOSE's consistently energetic performances night after night, extensive merchandise line and rapid sales on the road - proving their powerful fan engagement ability. Waylon Reavis adds, "Working with AMERAKIN OVERDOSE was a blast. I love how the track turned out. It was a nice change to create something that forced me to put myself in a different headspace." AMERAKIN OVERDOSE brings a raw energy and heaviness to hooky hard rock that has long been missing from the industry. Primary production credits on The Great Amerakin Dream go to AMERAKIN OVERDOSE mastermind and vocalist Cody Perez and multi-instrumentalist The Human, who work closely together to write and record their music at Human Studios. 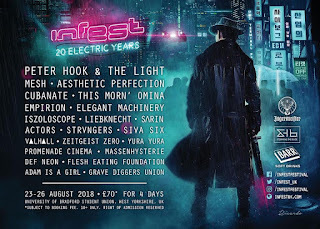 The album also features guest production from Ahrue Luster (Ill Nino, Machine Head), further pushing the sonic envelope and positioning the band with a bright future the hard rock scene. Band members Perez and The Human are flanked by bassist Brandon Sills, drummer Brick, and Pete "Filth" Perez on backing vocals. Stay tuned for more coming from AMERAKIN OVERDOSE leading up to the release of The Great Amerakin Dream.